Recommended for homes with P15,000 to 35,000+ monthly electric bills- OR if you have several refrigerators, freezers, pool pumps, water pumps, and run 2hp or more aircon in the DAYTIME. If nobody is home during the day but you have many fridges, this is for you, too! This can run 2 refrigerators and 4hp of aircon plus some lights and a fan during hot summer days. For free! This is a 20 panel build with a wifi monitoring system so you can monitor how much you’re harvesting when the sun is shining. Not all houses are the same. If you need extra long cable runs from inverter to panel board, a tiled roof which needs a lot more TLC, or some extra ordinary wiring work or roofing structural support work, we have to inspect and give you a customized quote. Pricing above does not include any permitting fees, if required. What can a 5 kW system power? This can run 2 big refrigerators and 4hp of aircon plus some lights and a fan during hot summer days You will harvest an average of 22.5kWh of usable daytime power. • If your roof needs scaffolding or has a very steep pitch, or is a “complicated roof”, a survey needs to be done to give an estimate for installation. • Service disconnect main breaker if Meralco requires it for net metering applications, is not included in this quote. • 50% downpayment, 25% upon delivery, and 25% upon energizing. We usually have this in stock and can install within a week or so. • We need to wait for check clearing prior to delivery. • Installation takes a minimum of 2 days. • The grid-tie inverter has a standard 5 year manufacturer’s warranty, extendable to 10 to 25 years. We can lend you a loaner inverter while waiting for manufacturer to repair or replace your unit if necessary, but this is rare. 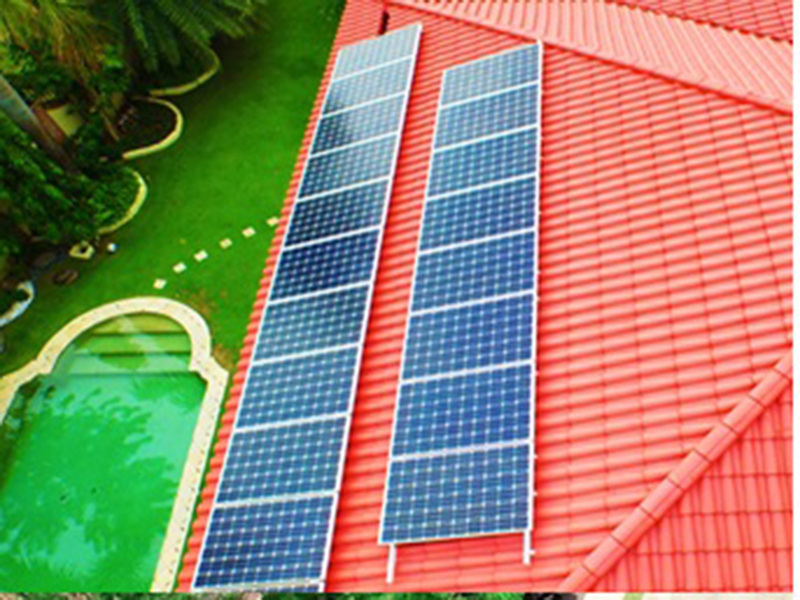 • Panels have a manufacturer’s warranty of 5 years and 25 year power output guarantee. Estimated de-rating of power is 10% on the 10th year and 20% on the 20th year.